Enhance your brand image and with our advertising Custom Feather Flag 7 ft x 30 inch Single Reverse Print, reads correct on front side of flag and reverse image of back side of flag. Windless feathers flags stay open, no wind needed. Our Feather Banners are made in the USA. 8 ft tall with premium pole set, rotating ground spike.Email flag art to sales@flagamerican.com. 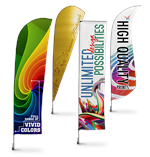 - Custom Feather Flags will attract customers to your business. Single Reverse Print, reads correct on front side and reverse print on back side. We do not recommend double sided flags since they are very heavy and may tilt the poles. 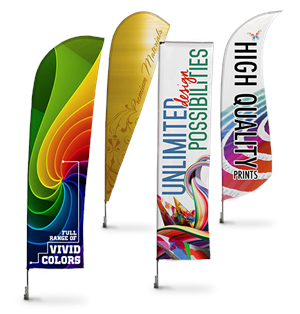 We offer a huge selection of custom feather flags, custom blade flags, feather banners, teardrop flags, flying banners, bow flags which are eye catching and are used for indoor and outdoor advertisement. We have specialized printing techniques that make will promote your business with eye catching results. Feather Flags, Blade Banners, Feather Banners, Teardrop Banner and other advertising flying banners are made of full color logo or image using digital printing which will enable your product to maintain longevity and reduce fading.You can pick and choose the optional ground spike or stands for you specific use and wind conditions. Our custom feather flags will advertise and attract customers to your new homes, welcome customers, advertise your business at trade shows, auto dealers, corporate events, and sports venues. While each banner features a flying effect outdoors, it also makes an impressive display for indoor promotions. ARTWORK Vector artwork is preferred - Artwork assistance is available - Pantone Colors needed to ensure color matching. Perfect for displaying your Corporate Logo Flag or Advertising Flag Message. Also, choose the correct flagpole accessories to display the Feather flags outside or inside at conventions , trade shows and expos. CUSTOM FEATHER BANNER FLAG 15 ft Complete Premium Feather flag Pole Set, Storage Bag , Rotating Ground Spike , NO SET UP CHARGES, Our feather flags are the longest lasting, made in the USA.